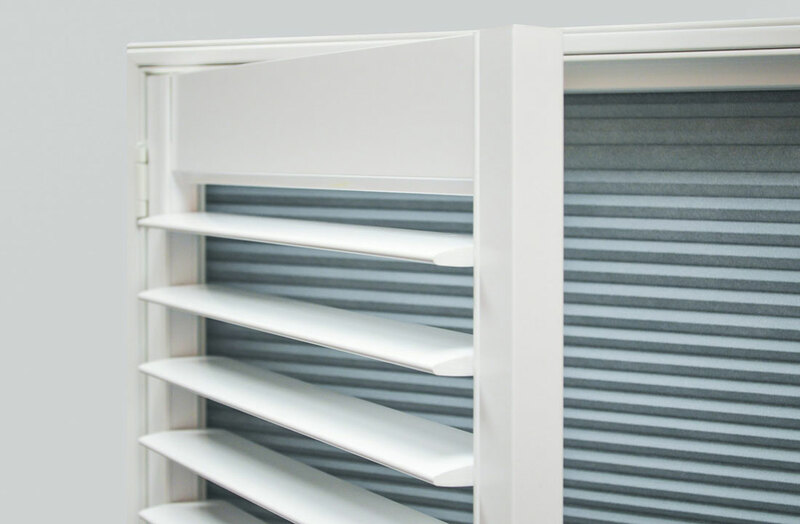 The function and appearance of shutter blinds are determined by several factors, with the louvres (also known as slats) being the major one. Running horizontally between the stiles of the frame, the louvres have different functions including the intake of light and air, controlling privacy levels, regulating the temperature of the room, all while giving your shutters a stylish look. As your shutters’ louvres are an influential feature, it’s important to get them right. The size of your louvres will not only influence their appearance but their functionality too. Thick or thin louvres will determine the level of light, privacy, ventilation and insulation your home enjoys. The 47mm is our smallest louvre and creates the most privacy, however, does not allow as much light in as our more wider louvres. Because of this, the 47mm is ideal for rooms that require the most privacy such as small toilets, utility rooms and walk-in wardrobes. 63mm are our most popular size due to their flexibility. They still give you some privacy when opened, but let a lot more light in. Not too big, not too small, the 63mm louvres are compatible with shutters of any size and shape in terms of aesthetics, hence their popularity. 76mm louvres have all the benefits of 63mm, with a subtle aesthetic difference. 76mm are great if you want slightly wider louvres, would like to appreciate the great outdoors or maintain more light entering your property. The 89mm louvre is ideal for lounges and dining rooms are they allow a generous amount of light into the room while still allowing for a moderate level of privacy. The wider louvres make your window appear less busy than the smaller louvres. 114mm offer the least privacy when opened, but also bring in the most amount of light. Because of this, 114mm louvres are best suited to dark rooms, big and tall windows, and interiors with a sense of drama to the design. For more information on our different louvre sizes available, or to book your free no obligation in-house survey, call the Totally Shutters team today on 0203 960 6963. All shutters come with a 5-year guarantee. Totally Shutters fitted and installed two sets of shutters in my living room. We're very happy with the finished result and the installation process. Totally Shutters has successfully supplied shutters to both residential and commercial premises in London, Kent, Surrey, Essex and throughout the UK. With over 15 years of experience, Totally Shutters have been providing superior quality, service and installation to residential and commercial properties around London, Kent, Surrey, Essex and throughout the UK.